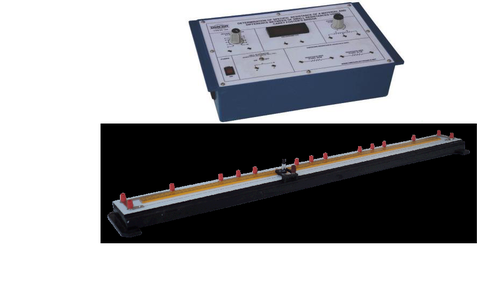 Omega Type ES-225 Experimental Set Up has been designed specifically to determine the resistance per unit length of Carey Foster’s Bridge wire, the difference between two small resistances and the specific resistance of the material of a wire using Carey Foster’s Bridge. The set up is absolutely self contained and requires no other apparatus.Practical experience on this set up carries great educative value for Science and Engineering Students. Determination of the resistance per unit length of a Carey Foster’s Bridge. Determination of difference between two small resistence using Carey Foster’s Bridge. Determination of specific resistance of the material of a wire using Carey Foster’s Bridge. Cell Eliminator with switch voltage1V5 substitute Leclanche Cell. Carey Foster’s Bridge - Four gaps, Sunmica top with sliding jockey OMEGA TYPE CFB-182. Adequate no. of connecting wires, 50cm long. We are involved in the trading of scientific instrument and electronic lab equipment comprising biological microscopes, biotechnology & pharmacy products, glass wares, analytical laboratory instruments & laboratory chemicals. In addition to this, we also offer turnkey solutions for chemistry, physics and electronic laboratories providing various benefits to the customers such as timeliness completion & no burden regarding servicing. Our range of Scientific Laboratory Equipment and Electronic Lab Equipment includes Analytical Laboratory Instruments, Biological Microscopes, Olympus Microscopes, Stereozoom Microscope, Physics Lab Equipment, Electronic Measuring Instrument, Digital Storage Oscilloscopes etc. Our industrious and meticulous professionals have thorough knowledge in our range of scientific instrument & electronic lab equipment which enable us to offer accurate solutions in turnkey projects. Capitalizing on our wide vendor network, we are able to offer the best products to our clients in the stipulated time period. We are marketing and trading various products from some of the renowned brands, namely, Omega Electronics, Olympus Opto Systems India (P) Ltd., Systronics and High Purity Laboratory Chemicals (P) Ltd.